Home Page | Uncategorized | Your guitar’s scale length, Does impact it’s tone and playability? Your guitar’s scale length, Does impact it’s tone and playability? Ask any guitarist what features influence their decision-making when buying a guitar and from most you’ll get the same response: wood, pickups, neck profile, fretboard radius, action, body shape and color. Apart from color, all of the above affect playability and tone, which should be the key criteria on which any buying decision is made. However, you rarely hear a guitar player mention scale length, and scale length has a significant impact on both playability and tone. Scale length tends to be thought of as the distance from the nut to the bridge saddles – string length. 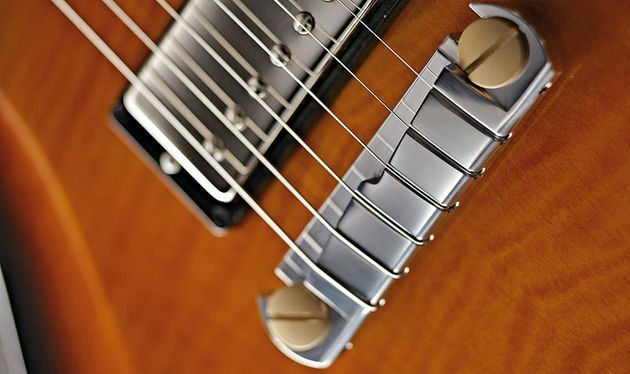 But since nearly all electric guitars have adjustable saddles and acoustic guitars have a compensated bridge saddle enabling each string to vary in length and be intonated correctly, scale length is more accurately calculated as twice the distance from the inside edge of the nut to the middle of the 12th fret. 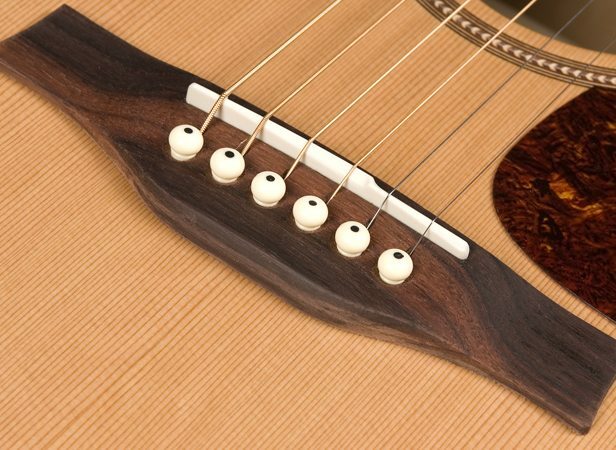 On a guitar, strings length is compensated to achieve good intonation, which means that string length is adjusted through saddle positioning, to allow for the fact that a string is stretched slightly sharp when fretting. Different string gauges require different levels of saddle adjustment. Hence, on an electric guitar the position of individual saddles will vary, some will be set further away from the neck than others, while on an acoustic guitar a single saddle piece will be set at an angle. The two most common scale lengths for electric guitars are 24¾ inch, found on many Gibson-style guitars, such as the Les Paul, and the longer 25½ inch, found on many Fender-style guitars, such as the Telecaster, Stratocaster and Jazzmaster models. The scale length used by Gibson has caused some confusion. Some people refer to it as 24¾ inch, while others define it as 24⅝ inch. Confusion exists for two reasons. Firstly, Gibson’s scale length has varied over the years. In 1954 it was 24 ¾, in 1959 24 9/16, in 1969 245/8, and 1992 249/16. Les Pauls are currently advertised as having a 24¾ inch scale length. Secondly, Gibson uses compensated string length to define scale length, while most other manufacturers, including Fender, give the uncompensated scale length. 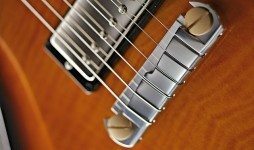 Once a Les Paul has been setup correctly, the length of the low E string from the nut to the bridge saddle will be 24¾ inch if fitted with Gibson’s recommended string gauge, but it’s uncompensated measurement from the nut to the 12th fret will be closer to 245/8 or 249/16, depending on year of manufacture. Compensated measurement seems a strange way to define scale length. Because all the strings on a guitar have a different thickness and different players prefer different string gauges, compensated scale length will vary across all the strings on a guitar and from player to player, depending on the guitarists string gauge preference. When selecting a guitar, scale length should be a key consideration. Woods, thickness, body shape, type of neck joint, pickups, and electronics all have their part to play in influencing tone, but scale length defines the source harmonic content with which all other components interact. The 25½ inch scale length is renowned for producing a rich, strong, bell-like tone with a well-defined bottom end. It is the longest scale length commonly used for electric guitars. It offers more sparkle, shimmer and brightness than shorter scale lengths. Fender’s Telecaster, Stratocaster and Jazzmaster models tend to be fitted with single-coil pickups to accentuate these factors. On a 25½ inch scale guitar, the spacing between frets is longer when compared with shorter-scale guitars. Fret for fret, notes resonate on a longer string length. Bass notes are firm, clear and bold. The harmonics on a 24¾ inch scale guitar are more densely packed than on guitars with a longer scale, which leads to a thicker, warmer tone overall. You just don’t get the same creamy tone out of a 25½ inch scale guitar that you get from one with a shorter scale. To be tuned correctly, strings fitted to a guitar with a 25½ inch scale length have to be placed under more tension than strings on a shorter-scale guitar. Strings on longer-scale guitars will feel tighter and firmer than those fitted to one with a short scale. This affects playability. Because the strings on a shorter-scale are under less tension, they are easier to bend and fret. 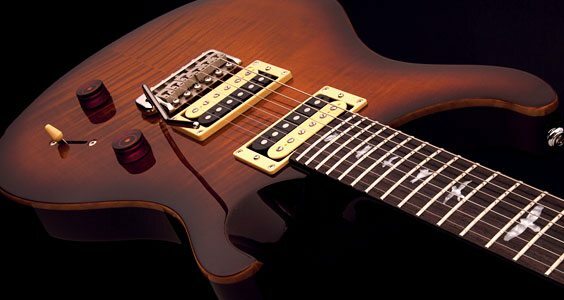 The wider fret spacing on longer-scale guitars also means that, depending on the size of your hands, they can be a little more difficult to play than those with a shorter scale. Fingers have to stretch further. No matter what components you fit to a 25½ inch scale guitar, you’ll never get it to sound or play the same as a guitar with a shorter scale, and vice versa. Scale length is just so fundamental to the tone and playability of a guitar.